Orthodox Church liturgical Deacon clergy vestments (white-silver) by Istok Church Supplies Corp.
No time to go shopping for liturgical vestments? 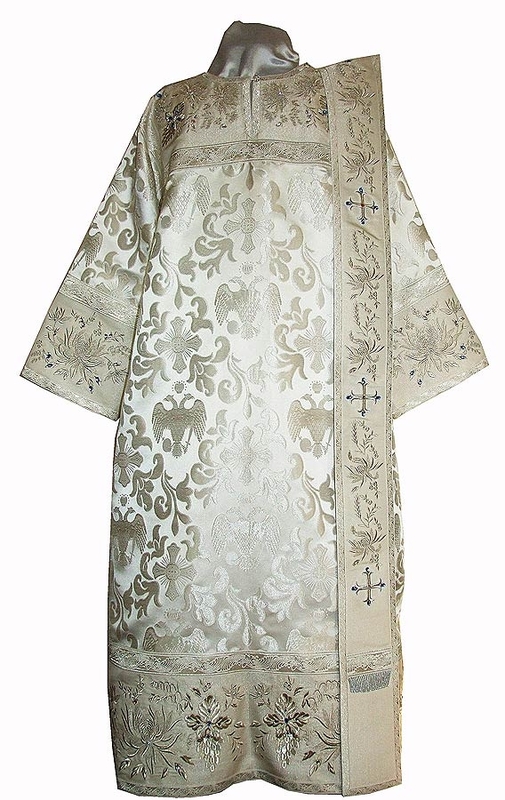 No worries for Istok Church Supplies is a reputed one-stop online store for a wide variety of bespoke Orthodox Christian vestments including deacon vestments (White-Silver). With our convenient and hassle free purchasing process, you’ll never want to go anywhere else for your requirements of Orthodox Christian church goods! We offer high-quality Deacon vestments (White-Silver) as complete sets that contain the orarion, sticharion and epimanika. They are made from fabulous materials such as rayon brocade, metallic brocade, natural German velvet and embroidered fabrics. Our master tailors know how to work with these exquisite materials in order to construct a perfectly fitting vestment made just for you. With our dedication to continuing age-old sacred traditions, we craft each vestment individually according to your bespoke measurements. You will find the difference in the materials, fit, impeccable construction and perfect finish. 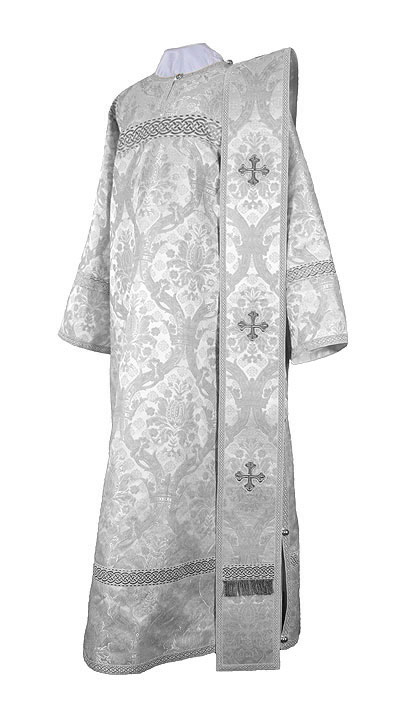 Our Deacon vestments (White-Silver) are perfect for observing feasts and days related to our Lord and Savior and Bodiless Powers. We provide plenty of options for you to customize your order. From the fabric to the type of adornment, you can make the vestment reflect your style of worship. To increase the life of the vestment and enhance user comfort, we provide natural rayon lining and natural velvet inserts for all our deacon vestments at no extra cost. For decoration, you have two options – standard type and premier type. For standard adornment, we include beautiful crosses and good quality galloon free of cost. You can upgrade your order with premier type decoration that consists of exquisite hand-embroidered crosses and solid jacquard galloon. Orders can be placed online by providing individual measurements as per our Online Measurement Chart. We take a few weeks to execute orders but once you experience wearing one of our excellent quality vestments, you will truly appreciate just how much work and skill goes into putting together the perfect deacon’s vestment.